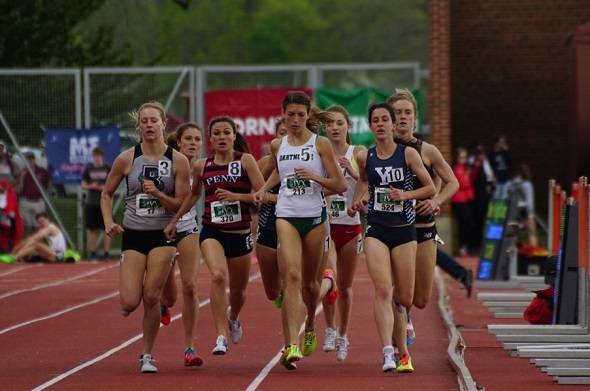 The next stage of the NCAA season is upon us – the Region Preliminary Round. Today, the list of the declared athletes for the NCAA East Region Preliminaries that will be held in Jacksonville, Fla. on May 26th to 28th were released. This list was based on the descending order as seen on Track & Field Results Reporting System with performances up to this past Sunday. Each individual event has up to 48 entries, while the top 24 declared relays will be heading to Jacksonville. So who from HepsNation will go? From our count – 122 performances and 2 relay teams made the cut. Cornell leads all of the teams with 26 qualifiers, while Harvard has 13 individuals and 2 relays (women’s 4×100 and 4×400). This tally includes three regional leaders (Rudy Winkler in the hammer, Courtney Smith in the 10km, and Sam Mattis in the discus), 16 top-10 regional performances by 15 athletes (Gabrielle Thomas in the 200m; Cecilia Barowski in the 800m; James Randon and Frances Schmiede in the 1500m; Nick Tuck, Eddie Owens, and Paige Kouba in the steeplechase; Thomas Awad and Emily de La Bruyere in the 5km; Caroline Kellner in the 10km; Autumne Franklin, Jade Miller, and Taysia Radoslav in the 400m hurdles; Stephen Afadapa in the high jump; Adam Bragg in the pole vault; Nikki Okwelogu in the shot put and discus throws; and Rob Robbins in the javelin), and pretty much all of the women from the Outdoor Heps 1500m final shown above. Four athletes intend to double up in Jacksonville. Freshman Zach Menchaca made the cut in the 100m and 200m, while de La Bruyere is going to use the schedule to her advantage and complete the steeplechase/5km double. Mitchel Charles is joining Okwelogu in the shot put/discus throw double. There are three athletes who could potentially complete a triple – Gabrielle Thomas, Autumne Franklin, and Jade Miller are going to Jacksonville for individual events but were members of the qualifying 4×100 and 4×400 teams for Harvard. They will likely need to race the relays if Harvard wants their teams to make the trip to Eugene, Ore. for the NCAA finals. See the list below for a full breakdown of who qualified in which event. This entry was posted on Thursday, May 19th, 2016 at 2:30 pm. It is filed under Athletes, Spotlight. You can follow any responses to this entry through the RSS 2.0 feed.